We take a look at some of the biggest mistakes made by fishkeepers — and not just newcomers to the hobby! In these days of ultra bright lighting you can actually have too much light, and have it on for too long. Your tank only needs light if you grow plants, or corals, and given the choice, your fish would much rather be in the shade. For plants or corals 10 hours per day is fine, or with very bright lighting you can have an even shorter photo period. Anything over that, or if you just have fish, you will get algae. For a fish only tank just light the tank for viewing - ie when you are at home, sitting in front of it. Ambient room light is fine at all other times, or how about some small LED spotllghts strategically placed, instead of a blanket of light across the whole tank? Algae is the main cause of people leaving the hobby, so stay keen and don't give it an excuse to grow. This is very common with brand new fishkeepers and is a classic schoolboy error. The filter media harbours beneficial bacteria (beneficial because they convert harmful fish waste into less toxic forms,) yet chlorine and chloramine are put into tapwater by water authorities to kill bacteria. 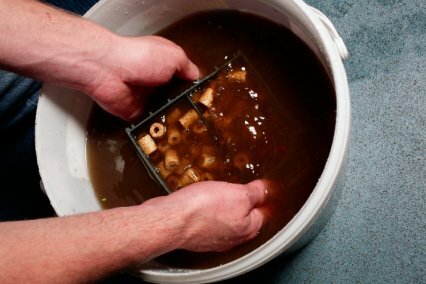 So clean your filter media, but clean it in old tank water, and that mucky water makes great feed for your house and garden plants. You probably thought we'd say overfeeding didn't you – but we see many more underfed, rather than overfed fish on our travels. After speaking to many fish nutrition experts we reckon it is pretty difficult for a goldfish to overfeed itself to death for example, and that the resultant water quality issues from overfeeding and uneaten food are a much more likely cause. So, feed your fish regularly on a good quality diet and it will be more healthy, better at fighting off disease, and much more likely to breed. If there is one bit of advice that we feel more important than anything else in fishkeeping, it's to change the water. All owners of the best fish, and best aquariums and ponds in the world all change water very often, even when you or I would think there would be no need to. Water changes dilute pollutants, but they also wash away hormones and pheromones emitted by our fish in their captive environments. Water changes buffer pH, contribute vital trace elements that deplete over time and help to fight algae. Whether you keep plants, corals, cichlids, Discus, goldfish or even trout, change the water. When compared with nature, our aquariums and ponds aren't as big as they may seem. Small bodies of water only hold small populations of fish, and only with artificial filtration and aeration can we break the rules of nature and place more fish into a given space than it would naturally allow. The result is a much more colourful, busier, more enjoyable spectacle in our living rooms, but that can also lead to stunted growth, heightened aggression and disease. Keep smaller fish in a given space, and fewer of them, species requirements allowing, and you will have fewer problems. Want more fish? You're not going to like this, but you'll need to get another tank. We practice what we preach here at PFK and it is amazing the good that quarantining newly purchased fish can do. Many ailments cannot be spotted with the naked eye, and even then few people are skilled with a microscope to identify and then treat disease. So in many respects we are all buying our fish blind, and placing a newly purchased fish into a tank with many other fish from many other sources. 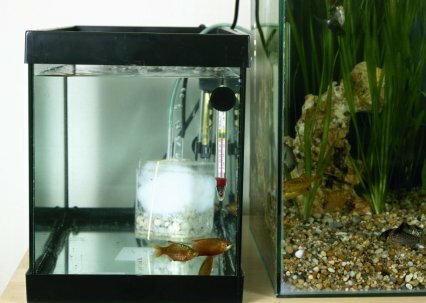 Move over some mature filter media (place a Biofoam 45 sponge inside your external filter,) and when you purchase fish, fill the tank with mature tank water, move the sponge over and you have a mature tank. Place a newly purchased fish into the tank (only one species from one batch, from one source at a time,) leave for several weeks and monitor their health. If you lose the fish, they won't take down the fish in your main tank and getting compensation by way of a replacement fish will be a lot more straightforward as that shop's fish will not have mixed with others and hence, cross contaminated. Whenever you want to buy a fish, you should first test the water of your tank to make sure that water quality is at its optimum. If you have a new tank, you should even test every day for a week before adding fish, just to make sure that there are no spikes. If you place a fish into a tank with failing water quality, you instantly have problems and it will mean stress for you and your new fish. Test water, if it is OK, add fish. If not, don't. We've all been guilty of this at one point or another. Fish shops are like sweet shops for us addicts, so every now again we spot a tasty looking stripy thing that we just must have. The problem is that the stripy fish may grow huge, or eat everything, or have requirements that you just can't cater for. Ask an assistant about the fish, tell them what you already have in the tank, and better still take a book or google it on your smart phone. We're not fish vets, and neither are 99.99% of the people who keep fish. As mentioned above we cannot spot many ailments and diagnosis can be shaky at best, so if you're not sure, don't just reach for the medication as a matter of course. The more you use a medication, the less effective it will be, and every time you do use one it may knock out some filter bacteria, or weaken a fish. Find someone who knows about disease, listen to their professional recommendations and dose accordingly. PFK has fish health experts on its panel, some companies have customer advice lines and onboard experts, so use them, and get it right first time. Arm yourself with water quality data, tank stats and a photo of the fish and they will be able to help much more thoroughly. Fishkeeping is a patient hobby. Plants take time to grow, fish take time to mature and develop adult coloration and finnage, and corals take even longer to grow. These things can't be rushed, and the worse patience related problem is stocking a tank too soon - quicker than the bacteria population can multiply enough to be able to cope. The weekends are the rush times. You're off work for two days and want to cram everything into that time, including fully stocking a new tank, or putting six months worth of fish additions into six hours. For the sake of your fish, and your sanity, don't do this and as frustrating as it is to just wait, you will save money in medications, test kits and fuel as you frequent the aquatic shop to try and remedy your mistakes. If you just have to buy something, buy a book or a magazine – or a plant. Don't buy a fish.